Additional Info: The plant is widely applied in Ayurvedic medicine and can be found anywhere across India, from Burma to Himalayan regions. Elements Applied: The commonly applied elements are stem and root bark, leaves, and fruits. Active Components: The elements which are considered potent in herbal medicine are characteristic of having tannin, pectin, volatile oils, and a bitter component. The ash produced from the wood has phosphates and minerals in abundance. Used For: Stimulates bile movements, kills parasites, reduces fevers, boosts sexual desire and metabolism, fights diarrhea, stimulates the digestive system, boosts blood circulation, fights constipations, and stimulates the organism. Ripe fruit is rich in nutrients, enhances metabolic rates and has a characteristic aroma. Fresh fruit is known to fight constipation. Green fruit is used for diarrheas, for stimulating stomach functionality. 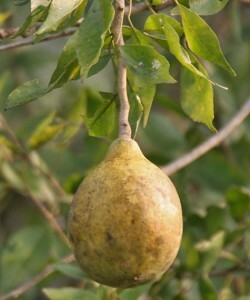 Pulp is applied for treating scurvy and fighting fevers. Fresh juice is highly pungent. The list of conditions addressed by the herb includes: dysentery, heart diseases, recurrent diarrhea, dyspepsia, diabetes, and common constipation. Root and stem bark decoction is applied in treating tachycardia. Leaf juice is known to have a wide range of applications, for instance, in diabetes.